Learn how to handle night weaning with these 6 steps! Help your baby stop waking up in the middle of the night and eat during the day instead. Night times were the worst. Even though I was sleep deprived both day and night, something about waking up when I was supposed to be asleep made those evenings hard. Waking up multiple times a night, with feeding as the only way to soothe your baby back to sleep, takes a toll on any parent. Those were the times when I’d wake up, delirious from the little sleep I managed to get. I’d yell at my husband or start hating my predicament. On good days, I’d find movies and shows on my phone to watch while I nursed (it’s how I watched The Tudors and Call the Midwife). Your baby may already be putting himself to sleep, but still wakes up to eat every few hours throughout the night. You wonder whether it is hunger that’s keeping him awake, especially when he doesn’t seem to eat much during the day. Other times, the frequent wake ups happen more out of habit, like when he’s already consuming all the calories he should getting during the day. You know he can sleep through the night without needing to eat, but he still relies on the comfort of drinking to fall back asleep. When should you start night weaning? Your baby doesn’t eat much during the day. At some point, your baby will be more interested in moving and exploring than in sitting in one place to eat. But if he’s not eating as much during the day, it may be because he’s still eating at nights. He can likely transfer the calories he consumes from nighttime to daytime. Your baby doesn’t really drink at night. Have you noticed that when you offer a feed at night, your baby either plays or conks right back to sleep? He may be using feeding time to play or to soothe himself back to sleep, not as a chance to satisfy hunger. Check with your pediatrician. The number one way to make sure it’s okay to start weaning night feedings is to ask your child’s pediatrician. She can let you know, depending on his growth and stage, whether he can drop those feedings and sleep through the night. Struggling with putting your baby to sleep? Wish he could learn to self soothe and sleep on his own? Join my newsletter and discover the 5 mistakes that are keeping your baby from self-soothing! I weaned at the same time I sleep trained my babies, which not only helped them consume their calories during the day, but rely less on nursing to fall asleep. Many babies wake up at roughly the same times every night. For several nights, write the times your baby wakes up, and see if you can find a pattern. Even with a wide variety of wake up times, take an average of the typical times he wakes up. What if your baby is inconsistent? If you find that he wakes up anywhere between 10:30pm and midnight, and again anywhere between 2:30am and 4am, go with the earliest time. In this example, you’ll say your baby wakes up at 10:30pm and 2:30am. 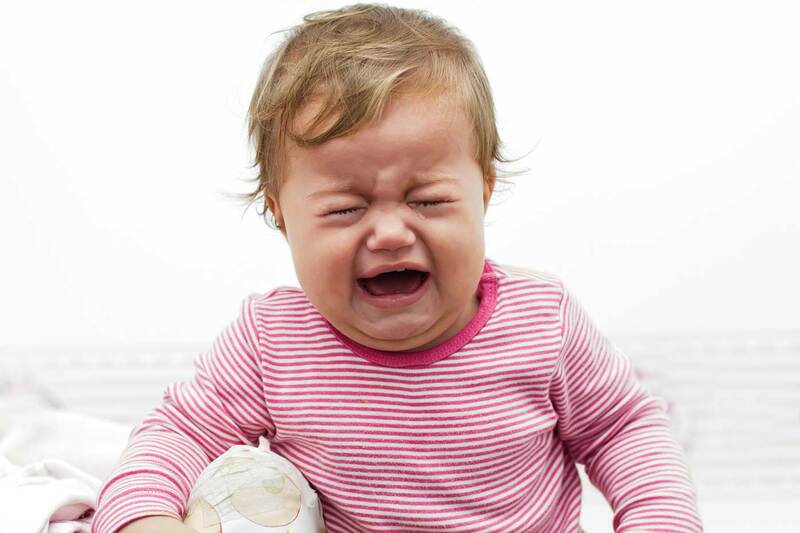 Get more tips on what to do when your baby wakes up crying hysterically. That’s right—you’ll be waking yourself and your baby up when you start weaning night feedings. The idea is to beat him to the punch and get to him first before he has a chance to cry for milk. You want to break the association that crying means he’ll get milk. In our example, you’ll wake yourself up at 10pm and 2am. If your baby cries any other time for milk, hold off on feeding him until those designated times. Reassure him instead that you’re doing things differently now and that he’ll get his milk soon. At those designated times—in our example, 10pm and 2am—wake your sleeping baby and feed him the usual amount he eats. If you’re breastfeeding, nurse however long you usually do. If you’re bottle feeding, give the same amount of ounces like normal. And give the same amounts at all wake up times. Let’s say he wakes up twice a night, and you normally nurse for 20 minutes. That first night, nurse him for 20 minutes each time. The previous night, your baby either reduced the amount of time he nursed or the ounces he drank from a bottle. The next day, add extra time or ounces to his feedings. Whatever amount or time you reduced the night before, make up for it the next day. If you had two sessions, that means you reduced his total nighttime feeding by one ounce (half an ounce each session). The next day, add an extra ounce throughout the day, such as adding a half ounce to the morning bottle and another half ounce to his midday one. Or you could add a whole ounce to the evening bottle as another example. You’re helping your baby take in less at night and more during the day. You and I eat during the day and none at all at night. Soon your baby will be able to do the same. The following night, repeat the same process of waking yourself up 30 minutes before your baby does. But now, reduce the amount you offer. If you’re breastfeeding, reduce each feeding session by two minutes. If you’re bottle feeding, reduce by half an ounce. You’re reducing the amount of milk your baby is consuming at night, while still keeping the same wake up times. On the third and subsequent nights, reduce the amount you feed again. Let’s say you started off at 20 minutes. The second night you nursed for 18, then you’ll nurse for 16 minutes on the third night, 14 the next, and so forth. Throughout this time, you’ll also be adding all that milk the following day. You’ll keep reducing the nighttime feedings until you’re down to the last few minutes or ounces. You can decide when it doesn’t seem to make sense to wake your baby up any longer. For instance, I stopped waking my baby up when I was down to four minutes. I didn’t see the point of waking him up the following night for two minutes when it seemed he could sleep through the night. What if the baby wakes up at different times than the designated wake up times? Let’s say you figured your baby wakes up at 10:30pm and 2:30am, but for the last several days, his wake up times don’t seem to match up. If it seems like he doesn’t have a clear pattern of when he wakes up, take an average of the times he does wake up and stick to one. If he does seem to have a new pattern that doesn’t line up with your designated times, adjust your alarm to accommodate that new time. Let’s say he’s now waking up at 10pm the last several days instead of 10:30pm. Adjust your weaning so that you wake him up at 9:30pm moving forward. Do I keep reducing the same amount for each session, or is it okay to combine the sessions into one? Your baby might be eating hardly anything for each session, so you’re considering combining the two (or however many sessions you have) into one. For instance, let’s say you’re down to feeding him for 6 minutes two times a night, and now you want to feed for 12 minutes once a night. If your baby doesn’t seem to cry at those designated times, you’ll likely be okay waking him up once instead of twice, and combining the two. But if your baby is still crying at those designated times, you’ll have better luck sticking to the same amount of sessions. What if the baby isn’t interested in extra milk the next day? Even with the reduced amount at night, you may notice your baby isn’t interested in drinking extra milk the next day. He might not finish bottles, or pull away from nursing, even though he didn’t drink those ounces the previous night. Your baby may not even have been hungry when he was waking in the middle of the night and was only using feedings as a habit. He might also not need as many calories in general now that his body isn’t growing as rapidly as it once did as a young infant. He may be in that developmental stage where he’s more interested in exploring and practicing his skills than he is with eating. If you’re concerned, check with your pediatrician about his weight gain and eating patterns. She’ll let you know whether there is an issue at hand. You can also feed him either in a “boring” room with little distraction, or in a new environment where he doesn’t notice he’s finishing his bottle. 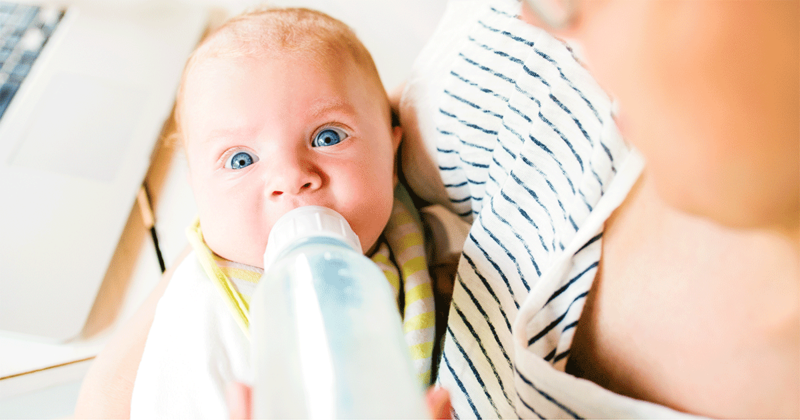 Read more about what to do when your baby goes on a bottle strike. Can I be flexible with how much I reduce each night? Yes! Two minutes and half an ounce each night is a guideline, not a rule. If you feel like your baby could use more calories, or you don’t want to wean so soon, feel free to reduce even less. I felt like my twins could benefit from a longer stretch of nighttime feedings, so I reduced their feedings by a minute. Sometimes I would even stick to the same number of minutes for a few nights in a row. Even though they were already sleep trained, I still stretched their feedings for a few more weeks. You know your baby best and can decide how quickly or slowly you want to wean. Waking up multiple times a night is like a rite of passage for many parents. The sleep deprivation ties us all together in one common experience, one we can relate with all too well. But at some point, you can wean your baby from nighttime feedings. Maybe he’s not even hungry, but is feeding out of habit. Or he is hungry, but you can help him consume his calories during the day instead. When you do, a glorious thing happens: you and your baby get a full night of sleep. No wake ups, no inconsolable crying. You can put him to sleep knowing you’ll also sleep well tonight. And you’ll stop dreading the evenings once and for all. Should Dads Wake Up with Baby Even if He Has to Work? Did you like this article about night weaning? Share it on Pinterest and Facebook!